We just got back from a brief family vacation in Sanibel & Captiva Islands, two little places connected by a causeway to Fort Myers, Florida. The weather was perfect throughout our stay: a low of 58 and a high of 80 and clear blue skies. This is a truly unique destination, where it never seems crowded, there are very national chains, and no high-rises. The area is known for it’s wild-life preservation and the beaches are famous for shelling. Despite vomiting the first night and an E.R. visit due to dislocating her elbow the second night, Caya had a blast! 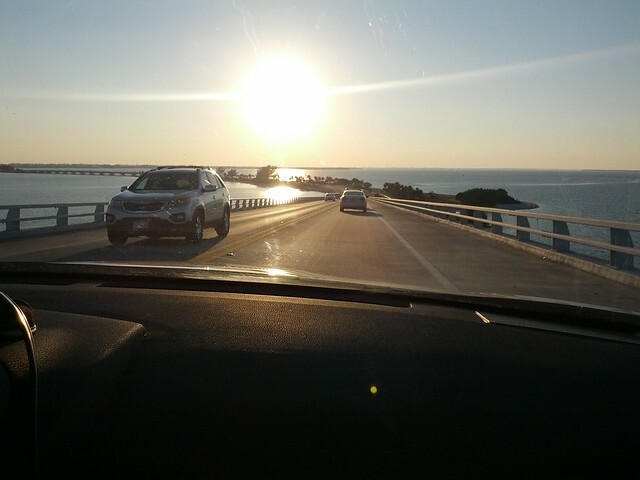 Sanibel and Captiva are relaxed places; and, of all things, driving was what stood out as distinctive. There are no traffic lights and drivers are noticeably considerate. The speed limit is low, between 15- to-35 mph, which means it takes a while to get around, even though Sanibel is only 12 miles long. Lots of people just bike. Either way, watch out for Gopher Tortoise crossings! The Sanibel Farmer’s Market is fantastic. There are tons of produce vendors (though oddly some sell non-local goods), a seafood vendor (with an extensive selection matched by an extensive line), lots of bakers and dessert stands, a fresh mozzarella maker, guacamole made right there (which collects quite the crowd), nut vendors, soap vendors, some BBQ, doggie treats, Italian red sauces, Persian salads, and more. Unfortunately, the farmer’s market is only open on Sundays. There are two well-stocked supermarkets for other days: Bailey’s 2477 Periwinkle Way, Sanibel, FL 33957 and Jerry’s 1700 Periwinkle Way , Sanibel, FL 33957 (with a collection of beautiful parrots that you need to see). We wish we could have stayed longer! 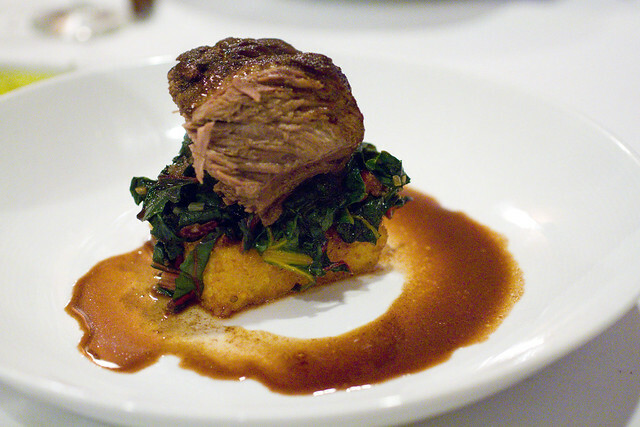 Still, we have to point out that Sanibel & Captiva don’t cut it as far as foodie destinations go. There is a remarkable lack of diversity in the dining scene, which makes sense vis-a-vis the homogenous population (read: mostly retired, white folks). The majority of restaurants have similar menus. Lunch menus typically include one hamburger, a fried grouper sandwich (the local fish), a Caesar salad, and crab cakes. Dinner menus were similar, adding a bouillabaisse-like fish soup (always with grouper) and a gulf shrimp dish. Under-seasoning or not seasoning at all became a consistent theme. We’re wondering if this is because of the large retirement population and their concern of sodium levels? On the up-side, the seafood, especially the giant gulf shrimp and grouper, are fantastically fresh everywhere. Produce was great as well. It’s the preparations that are pretty boring and after just a few days, this area managed to make me sick of seafood, or at least American-style preparations of seafood. Lighthouse Cafe 362 Periwinkle Way, Sanibel, FL 33957 claims to have the “World’s Best Breakfast” which is over-stated (to be polite). It is good though with quick and friendly service. It’s close to the lighthouse (short drive or bike away), but no view of it from the restaurant. R.C. Otters 11508 Andy Rosse Lane, Captiva, FL 33924 has outdoor seating and a little bunny hops around the premises. Pancakes were chewy and actually difficult to cut with a dull knife. The rest was not terrible, but not memorable. 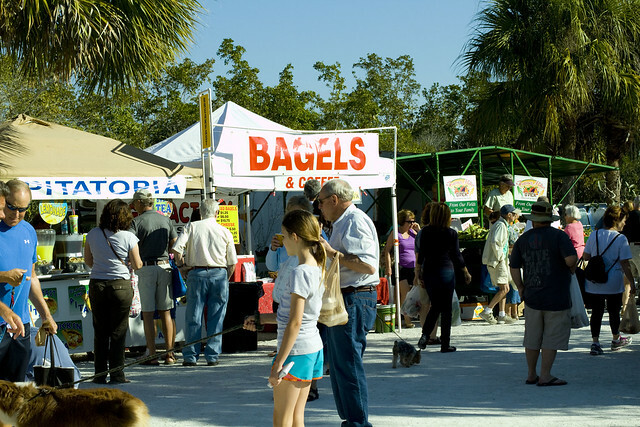 Sanibel Farmers Market 800 Dunlop Road, Sanibel, FL 33957 (outside City Hall) is the best option if it’s a Sunday. 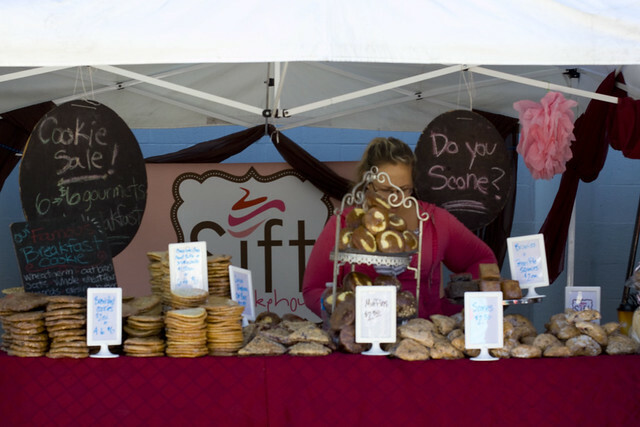 Inexpensive fruits, baked goods, and a few food trucks in a lush green setting where even the parking lot is rather pretty. There are a few tables & benches hidden away to turn it into a picnic. Scoops and Slices 5400 Plantation Road, Captiva, FL 33924 saw us stop by for a snack. This place is purely for convenience, situated right outside the main pool at South Seas Island Resort. If you don’t need food when you’re right there, you won’t miss the reasonably priced cafeteria-style pizza, Edi’s ice cream, and bulk candy. Sunshine Seafood Cafe & Wine Bar 14900 Captiva Drive, Captiva, FL 33924 has outdoor seating on their front porch. I give this restaurant a lot of extra credit in hospitality. Lon ordered a crab cake appetizer and asked if he could have some bread as well. He mentioned to the waitress that he intended to make it into a sandwich. The waitress was attentive enough to bring that information to the chef who then assembled a nicely plated sandwich for him for $1 extra (“bread”). Lon also took his cell phone for a swim and they were kind enough to give us a bag of rice to help dry it out. They saved his precious electronics. The Green Flash 15183 Captiva Drive, Captiva, FL 33924 has an amazing view and a place to dock your boat if you want to sail your way to lunch. They also have a strange sense of humor: a full set dining table in the men’s bathroom and a mannequin that looks like a guy taking a whiz in the women’s bathroom. Thistle Lodge at Casa Ybel Resort 2255 West Gulf Drive, Sanibel, FL 33957 has a more formal meal indoors but you can also have a casual meal poolside, which is what we chose. It’s a picturesque place that makes you feel like your definitely on vacation. The food is “pool food”. Old Captiva House 15951 Captiva Drive, Captiva, FL 33924 is terrible, made worse by relatively high prices. With the live piano and nice plating, I was ready to love it, but bad food and inaccurate menu killed it. For example, our salad was served with two disks of breaded and fried boursin cheese that had been sitting in the fridge and was not reheated before serving. Lon’s “bouillabaisse” turned out to be wet seafood linguini. 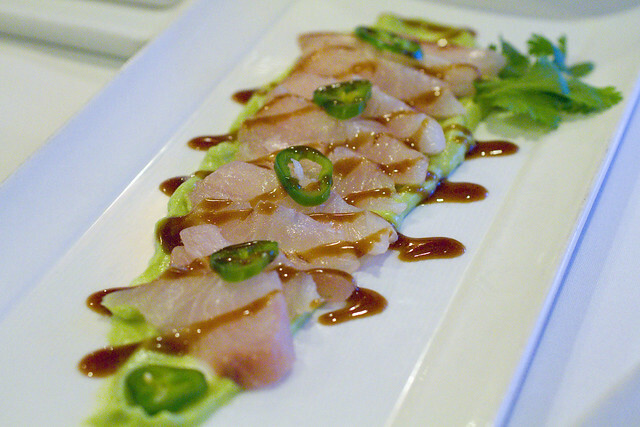 Sweet Melissa’s Cafe 1625 Periwinkle Way, Sanibel, FL 33957 was slightly more interesting than the rest, with a few Asian-influences, like the cured Japanese Yellowtail. I loved that entrees come in full sizes and petite sizes. The “petite’s” (half-sized dishes) are generous, which makes this restaurant a pretty good bang-for-your-buck. It’s one of the more modern decors around. The Mad Hatter 6467 Sanibel-Captiva Road, Sanibel, FL 33957 has a great waterfront view from every table in the house, this is where you want to watch the sunset. Service is pretty good and also one of the few places that started to season dishes. Food was hit-or-miss: with over-dressed and overly sweet salad and a half-raw shrimp; but still probably one of the better restaurants in the area because of the quality seafood used. 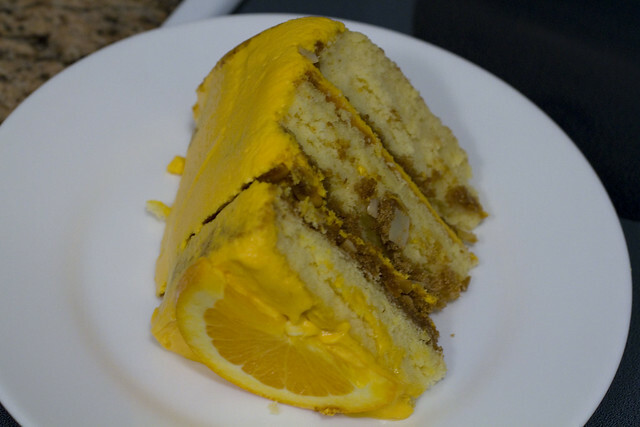 Bubble Room 15001 Captiva Drive, Captiva, FL 33924 has an award-winning orange cake so we took a slice to-go. We’re the type to always purchase more items than we can eat, but the messy looking restaurant also had a bunch of messy cakes in the dessert case and none looked appetizing. Yet our friend raved so we gave it a shot. There is food coloring in the frosting so I only took a bite of the cake part, which was surprisingly super tender and moist. As for the rest, Lon said I wasn’t missing anything. Simply Cupcakes (aka Dolce Tesoro) 2003 Periwinkle Way, Sanibel, FL 33957 offers a warm welcome and has very pretty cupcakes! I appreciate the extra tall cakes for being not super sweet; however, I have a feeling the buttercream is not all butter, possibly partially vegetable shortening, or at least something makes it taste and feel that way. We weren’t impressed with the flavors or the crumb. Queenie’s Ice Cream is a locally made brand sold at many shops. It’s pretty good stuff. *Note: the tap water in Sanibel/Captiva tastes like sulfer, so you’ll have to buy bottled water everywhere. South Seas Island Resort 5400 Plantation Road, Captiva, FL 33924 is a huge resort that takes up most of Captiva Island. Some of it is used as a hotel/resort, while others live in South Seas in permanent residences. I chose the resort as it has been featured as a “best” place for kids/families. The resort has suites with kitchens and is really quiet which is definitely nice. However, our stay was full of problems. First, our entire bedroom carpet was wet. I thought maybe it was cleaned before we got there so I gave it till the next morning and when it wasn’t dry yet, we asked for another room. The resort handled that well and upgraded us to a slightly bigger suite with a better view but overall, these buildings and rooms need to renovated and updated. The place is just too old. The next problem was that staff knocked loudly on our door twice while the “Do Not Disturb” sign was on the door. The first time it was a delivery guy (the resort had sent a bottle of champagne, we’re not sure why). The second time, it was the cleaning lady. Both times, Caya was sleeping and one time, I was sleeping! Lastly, I’d prefer a different location. Due to the super slow speed limit, it takes at least 20 min to get from Captiva to most restaurants on Sanibel. If you need to get to Fort Myers (like we had to to take Caya to the E.R. ), it’ll take roughly an hour. I had only looked at how many miles it was between different destinations. All-in-all, Sanibel & Captiva is the kind of place you go for a longer stay. It’s not a quick weekend kind of place and don’t expect much nightlife. You should settle in and relax. Get a place with a kitchen and prepare some of your own food with the great seafood available. posted by jessica	at 11:57 AM	Filed under Restaurants, Travel. You can follow any responses to this entry through the RSS 2.0 feed. Both comments and pings are currently closed. Looks wonderful! I remember going there and picking up great sea shells on the beach.